The Dolphin Encounter program at the Cabo Dolphin Center is an enchanting program where dolphin lovers have the chance to experience their first personal, interactive encounter with Pacific Bottlenose dolphins in a state of the art facility designed to enhance interaction between dolphins and humans. Visitors from 1 to 100 will be delighted by their first meeting with our friendly dolphins Frida, Dali, Merian, Monet, Ende, Toulouse and Renoir. Your experience will begin with an orientation in dolphin anatomy, physiology; behavior and history to help you better understand these fascinating creatures and their sophisticated underwater communication. After completing orientation, you'll enter our custom designed educational pool where a trainer will guide you through your interaction, including petting the dolphins' sleek skin and examining its physical characteristics. Our trainer will then demonstrate some of the training techniques and rewards they use to communicate with our Bottlenose dolphin companions and you'll have a chance to learn the training signals and feed the dolphins and be treated to a handshake and kiss from your new dolphin friend. This experience is open to children and adults of all ages. Children ages 1 to 3 are admitted free of charge but must be held by a participating adult. Children between the ages of 4 and 8 must be held by a participating adult. For the safety and security of our dolphins and our guests, Cabo Dolphin Center does not allow cameras in any of the pool areas. However, a team of photographers who are specially trained to capture your dolphin adventure will be on hand to ensure that you can commemorate this moment. Photographs may be purchased at the Dolphin Center, along with food, beverages, and souvenirs. To maintain the safety of our dolphins and to guarantee our guests a rewarding experience, tour sizes are limited. The Dolphin Center has been featured in the New York Times, National Geographic, The Los Angeles Times, Architectural Digest and Frommer's among many others, which means that encounters book quickly. It is imperative that reservations be made well in advance of your visit. Whether you've longed to have an up close encounter with a dolphin for years or are just interested in learning more about these amazing marine creatures, the Dolphin Encounter at Cabo Dolphin Center will offer you new insight on these most intelligent ocean dwellers while providing a delightful experience that you will cherish for the rest of your life. 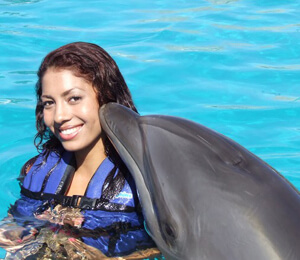 I have been to the Bahamas many times, but Cabo Dolphin Encounter is one of my favorite trips! It includes everything that everyone should do here. As a Bahamas veteran, I can say only the best about this experience!